He was six years younger than Jacques Offenbach and survived him by eleven years. 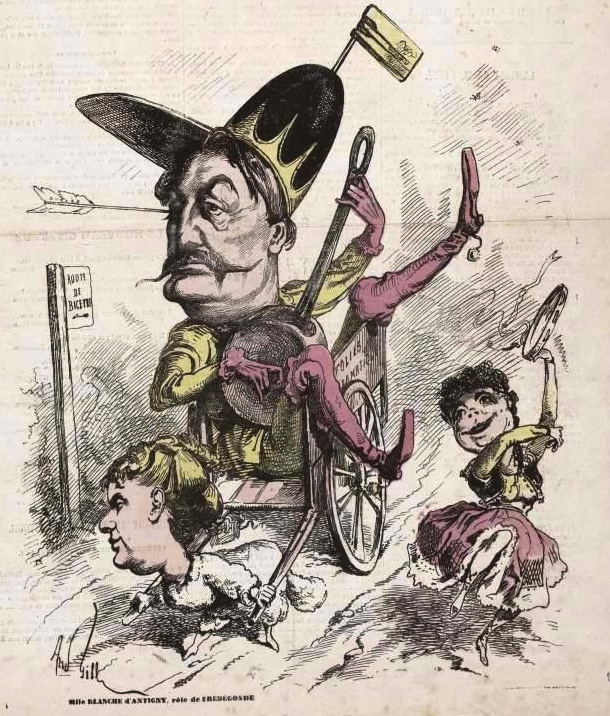 And just like Offenbach, he can claim to be the père de l’opérette: Louis-Auguste-Florimond Ronger, better known as Hervé. In German and English language regions he is almost completely unknown today and rarely performed. At the Opéra de Lausanne I was able to see Hervè’s most famous work in January, Mam’zelle Nitouche, written in 1883 for Offenbach’s star Anna Judic. Even if I’ll bore seasoned operetta aficionados here, I want to say a few words about the story that begins in a convent. There, organist Célestin secretly composes operettas under the pseudonym Floridor, which is a direct parallel to Hervé who did more or less the same thing. Denise is a convent school girl who discovers a pile of scores by Floridor, including his latest operetta, and she includes tunes from it in a solo rehearsal with the maestro. Denise is supposed to marry the officer Fernand, a member of the French aristocracy. For this to happen, Célestin is ordered to take Denise to Paris. But the subject of marriage (and of the a wedding night) is so embarrassing for the prudish mother superior that she tells Denise she’s only being taken to another convent. She’ll have to figure the rest out herself when the time comes. 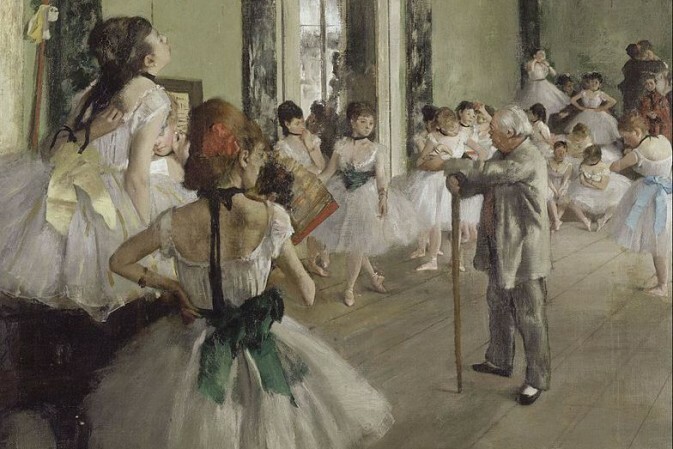 The trip to Paris with Denis is highly inconvenient for Célestin/Floridor because that same evening his new operetta premieres at the local theatre of Pont-Arcy. Denise persuades him to secretly spend the night in a hotel and take the morning train to Paris. That way he can attend the theater performance, she promises to remain in her hotel room. Which – of course – she doesn’t do. When Corinne, the star of the new operetta production, has a fit of jealousy because she thinks the composer is involved in an affair with the younger rival Denise, she quits the performance during the interval. And walks out with a bang. Luckily, Denise can take over since she studied the score back at the convent. 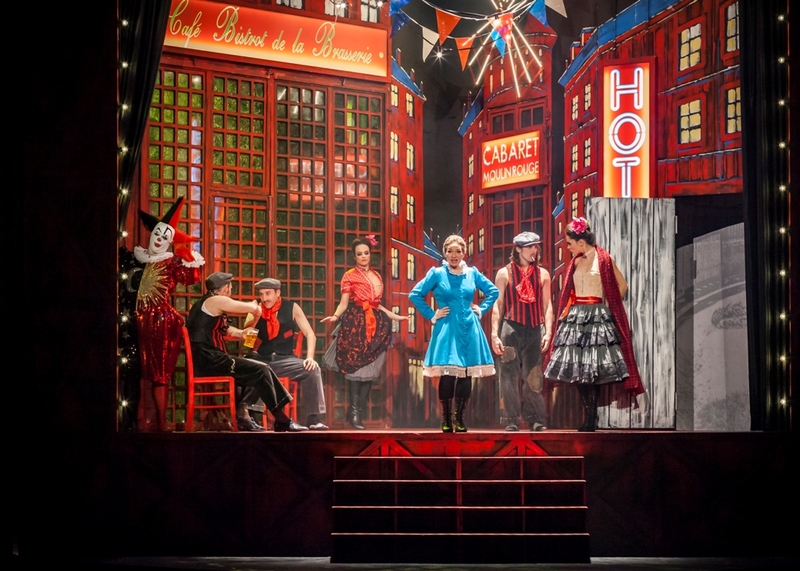 And she’s a big success as a leading operetta lady! The only one not too happy about all of this is Floridor because he’s persecuted by a choleric major who is an admirer of Corinne. On top of everything, future fiancé Fernand is also at the theater and sees Denise for the first time. They fall in love without knowing that they are supposed to be married. In short, total chaos ensues, which continues in act 3 in the barracks of Fernand, where the aforementioned jealous major is also stationed. Only in act 4 do all complications resolved themselves. 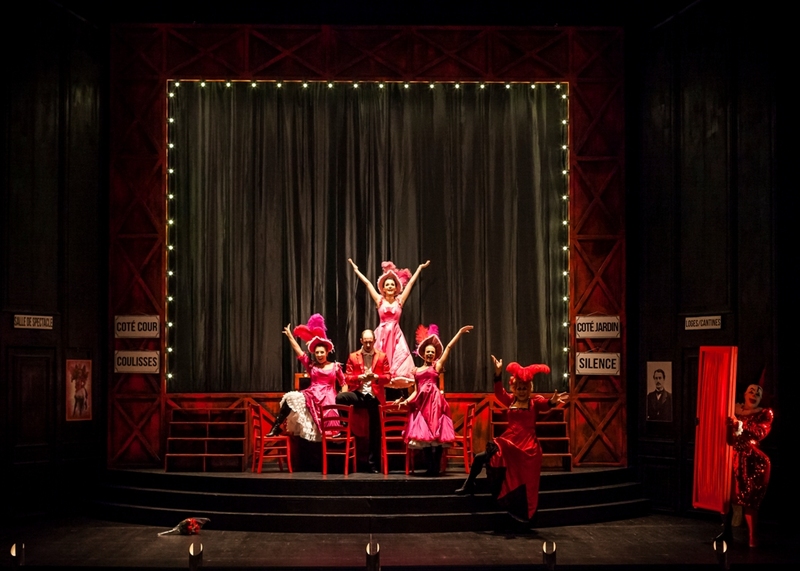 The staging by Pierre-André Weitz starts in the foyer of the theater where a big voiced clown announces the performance to the arriving audience. It’s the stage director himself, using the name Piero. He can later be seen onstage as well. Such a double role is often problematic, but here is works. Co-director Victoria Duhamel might have been the much needed external eye that gave constructive feedback. Weitz also designed the attractive and flexible stage: left and right there is a door with changing captions. The stage revolves and turns from church interior with organ to backstage at the theater of Pont-Arcy, to a street scene in the Parisian amusement quarters (for the play within the play) and the barracks. The characteristic and often ironic costumes are by Weitz, too. The choreography is by Iris Florentiny and Yacnoy Abreu Alfonso. In this setting, we get to see an opulent, sometimes breathless spectacle. It took me a moment to adjust to the dialogue, because what you hear is a lot of trumpeted sounds, squeaks, shouting and roaring. All characters are in a permanent state of excitement. Every monologue is delivered to the audience, which is something I usually don’t like at all. But … here it is the ‘style’ of the production, and everyone adapts to it wholeheartedly. I was taken by it after just a few moments and enjoyed it, enormously. Maybe it’s a difference in conventions between the German language theater scene and the French. In German this style might have had a rude and even dull effect, in French is elevated the performance to the exciting higher regions of nonsense, with charm and finesse. It made me think of Louis de Funès. The humor is not subtle. But I laughed a lot! Lara Neumann plays Denise. Whether at the convent or in the theater scenes (where she uses the improvises stage name ‘Mam’zelle Nitouche,’ which roughly translates as ‘Miss Don’t Touch Me’) or later in the operetta world: she is an endearing stage presence and very funny with watch as she transitions from a well-kept young convent girl to a somewhat more naughty diva who has to come up with the courage to go ‘all the way.’ She possesses a brilliant and well projected coloratura soprano that can also be heard well in the middle register. The quieter convent numbers shine with beautiful vocal lines, the fast numbers impress with sparkling nigh notes. 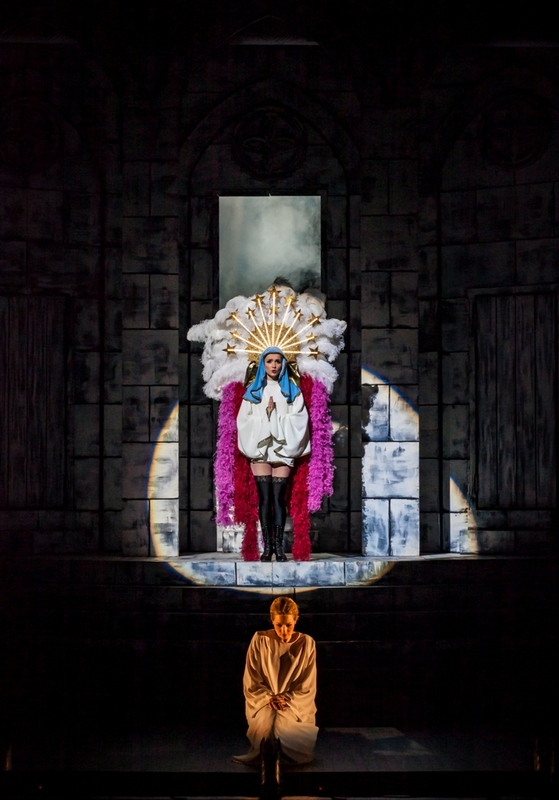 In act 4 she sings to her patron saint, Sainte Nitouche, who then appears in person. At the barracks she’s dressed up as a soldier and sings a hilarious song about her grandfather who played the drums in a military band – because he was hidden behind his huge instrument he never saw his wife betray him. Neumann’s diction, here and elsewhere, was precise, so that not a single nuance of the frivolous text gets lost. (This military band number must be well-known in France because everyone around me sang along when it was repeated at the end of the evening for the applause.) Denise’s big ‘Alleluja’ in act 1 is sung totally ‘non-classical,’ in the style of a French chanson. I guess Neumann might have copied a famous French singer here that I don’t know. Cute and amusing was Damien Bigourdan as poor Célestin/Floridor, always on the brink of a nervous breakdown. He possesses a pleasant tenor voice, but more importantly: you could also understand every word he sings and what he says in the dialogue when he explains to the audience this intricacies of his double life. It’s hilarious to watch how he runs out of plausible explanations about what’s happening in the scenes with the mother superior, the major, and Corinne. And how helpless he is when confronted with Denise’s energy and arguments that make him do what he knows he shouldn’t do. He’s the second lead role of the show, and not the lover Fernand. Even though Samy Camps is his equal, as an actor and singer. 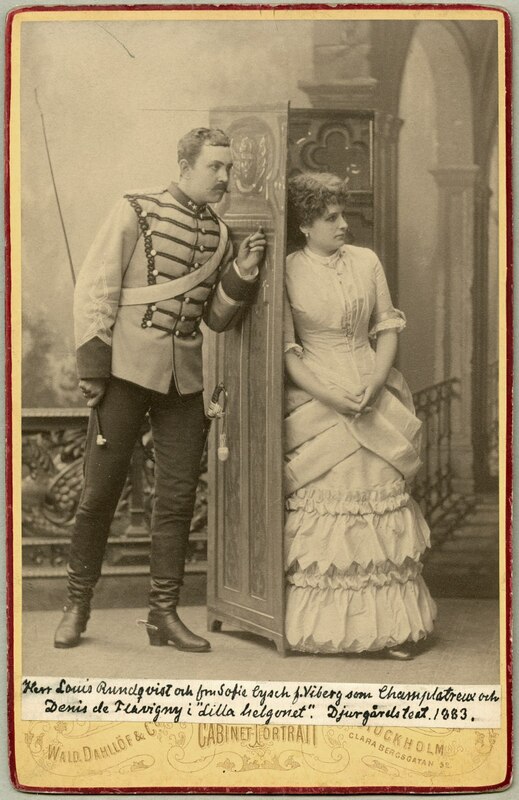 Scene from the 1883 production of “Mam’zelle Nitouche” in Stockholm. In act 1, the mother superior allows Fernand to meet Denise if he dresses up as an old inspector and she hides behind a folding screen. (To preserve her chastity, and his.) Later, in the theater scenes, he participates in the wild behavior of this fellow soldiers. So we know that Denise is not going to have a boring life with him! Surprising about Mam’zelle Nitouche is the fact that these are the only real singing roles. 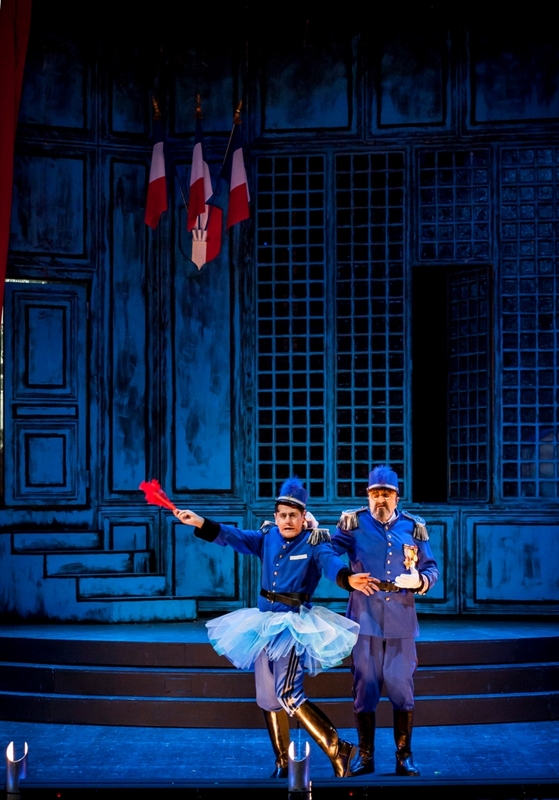 There’s a melancholy clownesque character at the barracks, but his couplet – about him stupidly following his father’s footsteps and becoming a soldier – can easily be handled by a singing actor. In this case, it’s none other than Olivier Py, known around the world as a famous stage director. In France he’s also known as an actor and author. Py presents this little musical gem as a memorable character study. 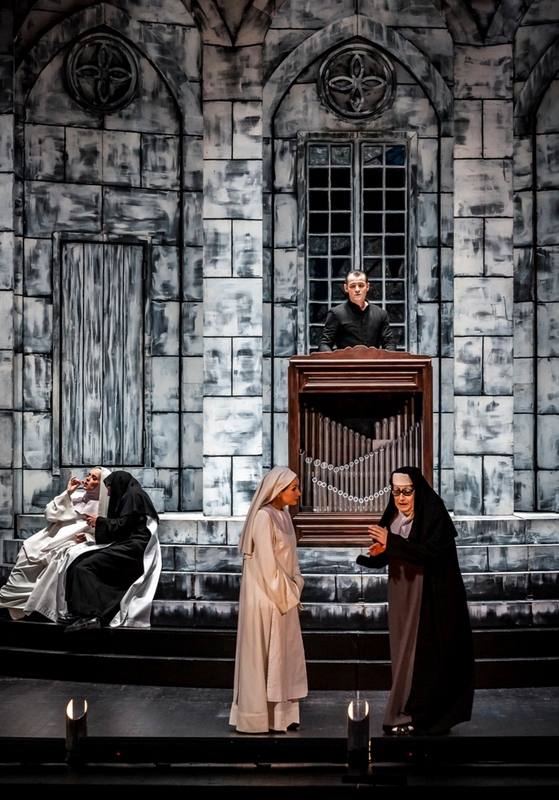 In the other three acts he’s seen as his own alter ego: Miss Knife as the effusive mother superior, the bitchy Corinne (who doesn’t sing in Hervé’s score but has falsetto quotes from Carmen, Dalila and Manon in the dialogue). 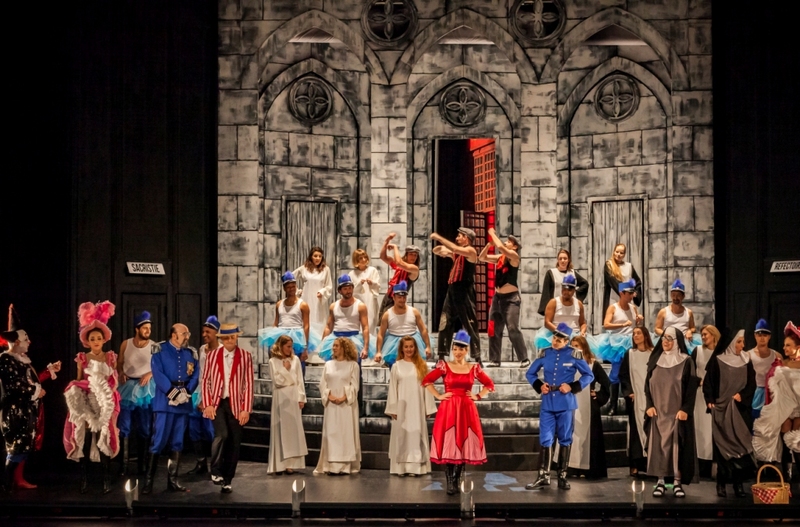 Py plays three differentiated and expansive characters, in the over-the-top style of the production. It’s grand to watch! The rest of the cast sings the chorus and smaller solo parts, all of them seem to have a lot of fun. Sandrine Sutter is Tourière, who reminds mother superior about the necessity of discipline. 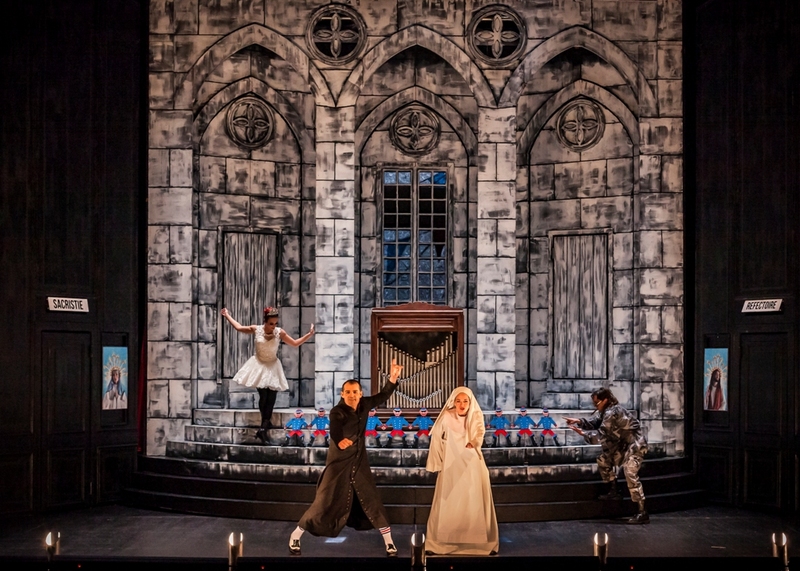 At the theater she’s Sylvia, who makes up for the female chorus with Lydie (Clémentine Bourgoin) and Gimblette (Ivanka Moizan), in the other acts they are the nuns and cross-dressed soldiers. 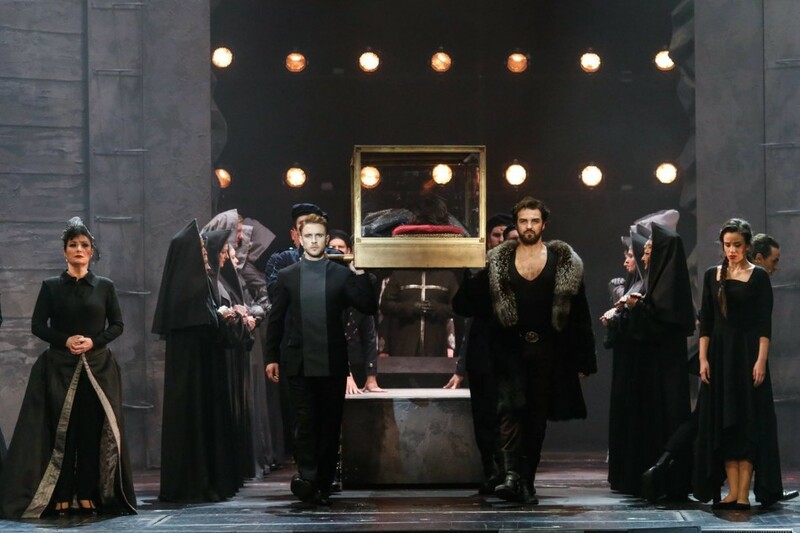 On the other hand, Pierre Lebon und David Ghilardi are Fernand‘s comrades Gustave and Robert, but they also play cross-dressed nuns together with Antoine Philippot (also the theater director). They can also be seen as ‘Indians’ in a wild revue number in the red light district scene. Mr. Lebon together with Mathieu Crescence is responsible for the sets and costumes. The number of costume changes for the entire ensemble must be worthy of the Guinness Book of Records. It’s a logistic miracle that they manage to do it all in time. Only the major wears the same outfit throughout: Eddie Chignara tries to make to most of this one dimensional choleric character. The chorus of the Opéra Lausanne doesn’t have much to do, but they do it well. And in the pit the Orchestre de Chambre de Lausanne and conductor Christophe Grapperon create esprit and drive. 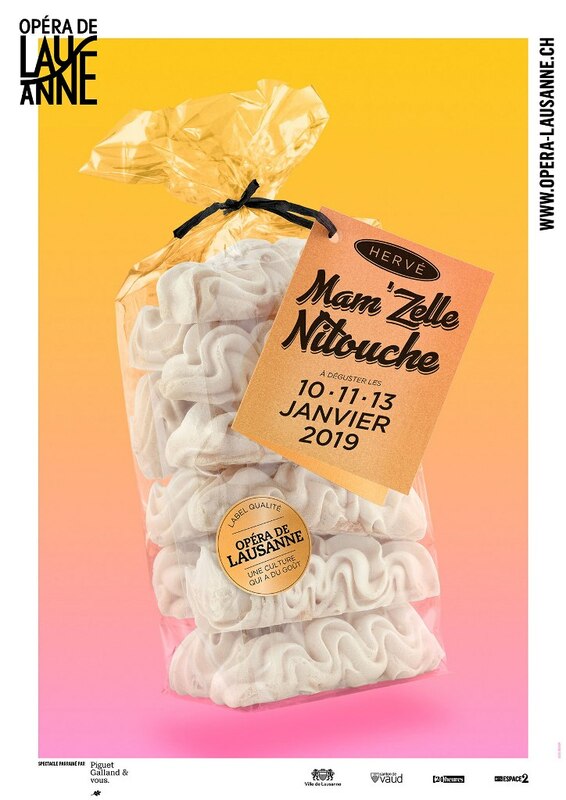 Poster for “Mam’zelle Nitouche” in Lausanne. The production is a co-production with numerous theaters in France (Angers-Nantes, Toulon, Limoges, Montpellier, Tours, Rouen, Avignon and Toulouse), but above all it’s a production by Bru Zane France. It was filmed on opening night and will probably be shown elsewhere soon, hopefully it will be made available online and on DVD. For more information click here. To read the original German article on Operalounge, click here. Free guided tours of the Palazzetto Bru Zane are interrupted throughout the month of August due to the summer break. They will resume from Thursday h September. My father and mother were part of this production in the Central Theater in Amsterdam in 1944. My father Cor Blenderman is also in the division of roles. I have heard them sing a lot from this production.